It has been a season. I teach my students to look for pivotal moments in their reading, and I, also, recognize pivotal times in life when I see them. So many things have been up in the air. We thought it might be time to pull ourselves away from our beloved Tunisia this year, and the exploration of that possibility took us through many soul-searching doors we hadn’t anticipated passing through. We are still in a state of wonder at the experience. Doors were slammed shut so resoundingly that our ears are still ringing. The universe spoke: We are meant to be here. And we have so very, very much to be grateful for. Many of our loved ones are experiencing sickness, pain, and loss. We are not. Hallelujah. At the moment, we’re OK! My heart, this advent, is fully with our adopted country. It has been our profound privilege to work and live inside Tunisia, these past six years, through their democratic transition. The awarding of the Nobel Peace Prize comes at a time when they are wondering what it has all been for. Recent violence from their own radicalized sons has been demoralizing, adding layer upon layer of isolation from the world, increased poverty, and deferment of their vision of a peaceful life with opportunities for their young people. 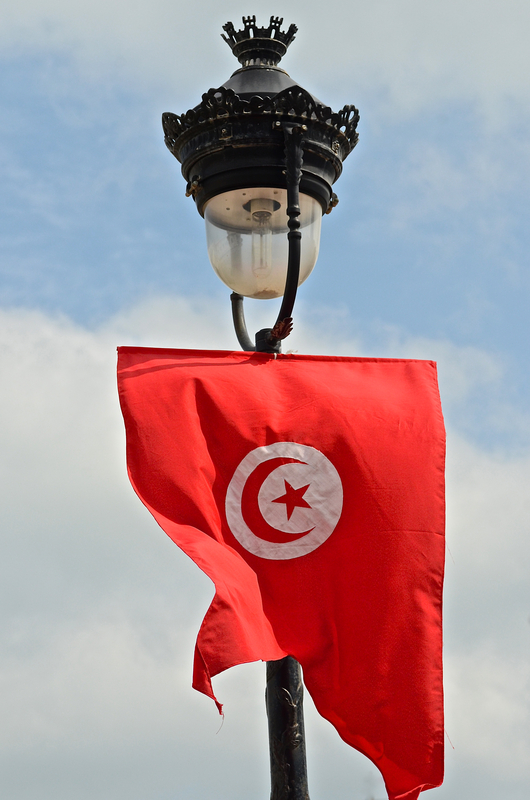 The Nobel committee honored the seemingly simple, yet most complicated way that the Tunisia National Dialogue Quartet worked to bring Tunisia back from the brink of civil war in 2013. They kept dialogue going between all constituents. They convinced parties to set aside their individual agendas. They held up core values as more important than ideologies. They took turns at leadership as they were needed. What a model for the world of how to make cooperation a priority in order to accomplish something more positive, for the greater good. I am so happy and proud of them. This performance at the Nobel ceremony stole my breath, and I have watched it at least 20 times. The passion, delicacy, defiance, and skill of Emel Mathlouthi’s performance represents the complicated spirit of Tunisia. I have gained hope from this award, and I pray it might be the external moral support Tunisia needs to carry through. Emel Mathlouthi in a letter sent to the Nobel committee. I brought fresh strawberry jam and biscuits to complement the incredible spread of dishes at my friend’s beach-side home. Successful biscuits are all about technique and intuition, not so much ingredients, except that they be fresh. Here, first, is the base recipe followed by some tips that I think are non-negotiable for getting the biscuits you want. 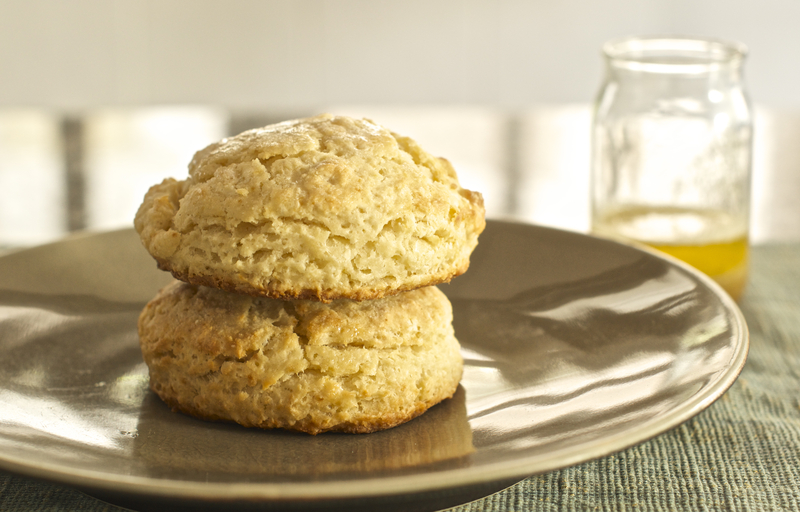 This recipe is perfect for savory or sweet biscuits. Grate frozen butter into cold, dry ingredients. I always keep my flour in the freezer, but then it comes in small packets, here. Working quickly, toss it through the dry ingredients. This creates a perfect integration of good-sized butter chunks throughout the dough, which will melt in the hot heat and create fluffy air pockets. 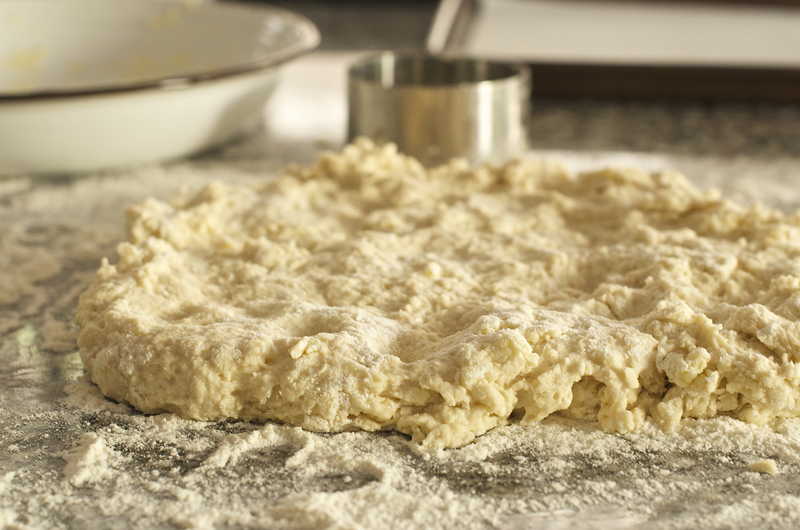 After adding the liquid, gently bring the dough together with your goal being to simply hydrate all of the flour and create a mass of dough. Stop working it once that has been achieved. Keep your dough shaggy. You don’t want it smooth; you want to preserve all of the texture you can. Keep a rolling pin away from the dough. Lift the dough out of the mixing bowl, lay it onto a floured surface, and gently poke it to stretch it to a consistent thickness. Leave the dough thick. I used to think that the baking powder would create some sort of magic lift for my biscuits, but it won’t. The volume I get in the end is what I leave in during the formation of the dough. Keep the dough, at a minimum, 1″ thick, and 2″ is not insane. Cut the biscuits with a real biscuit cutter. This tool will allow you to cut the dough without twisting, which will pull on the sides and decrease the loft of your biscuits. I don’t have one here, at the moment, and I tried using a sharp, stainless steel ravioli cutter. I got a pretty good result, but my biscuits still had slightly rounded tops and some diminished layering. 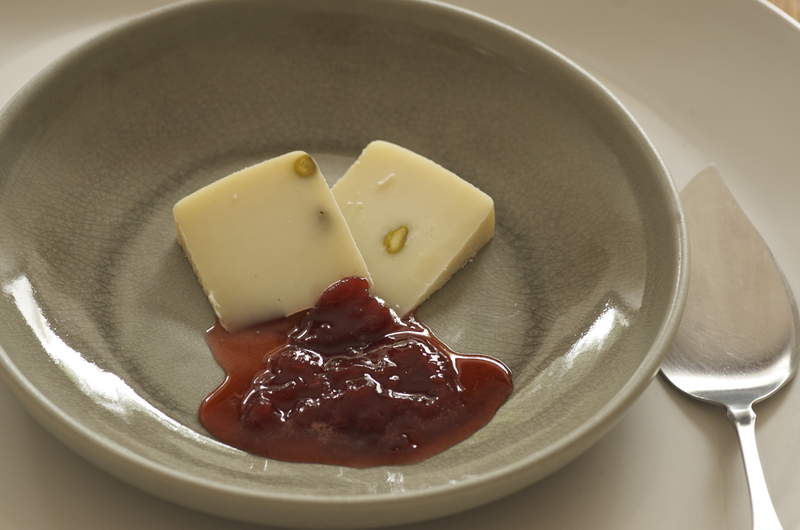 We have decided that our dessert alternative to strawberry shortcake, for this season, will be biscuits with strawberry preserves and pistachio-studded pecorino cheese. Uyehara, Mari. “Better Eat Your Breakfast.” Saveur. N.p., Mar. 2015. Web. 19 Mar. 2015. Wild, pokey plants are having a season right now. Artichokes are heaped in tri-stalked bundles, looking like one of the building materials the Three Little Pigs might have attempted to use for a home. 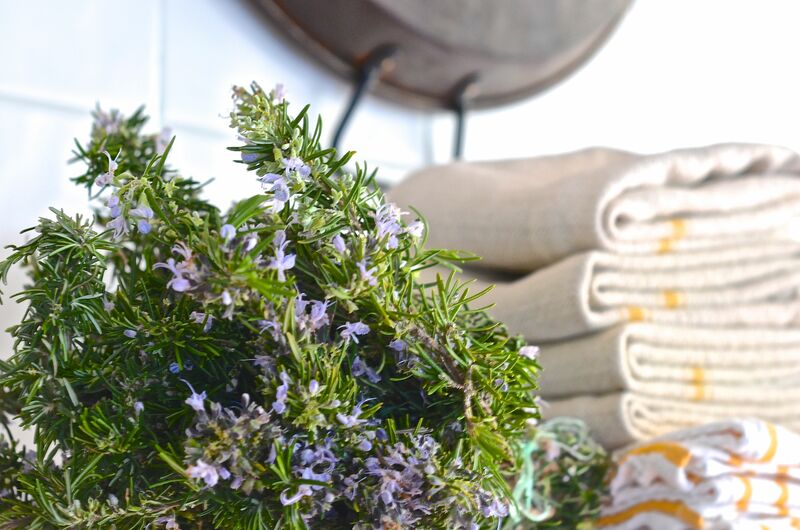 Purple-flowered Rosemary and wild thyme are also being sold in bunches, cut from their stiff, old-growth stems. Another vegetable lying around in heaps, one I have turned a wary eye toward all these years I have lived here, is the cardoon. 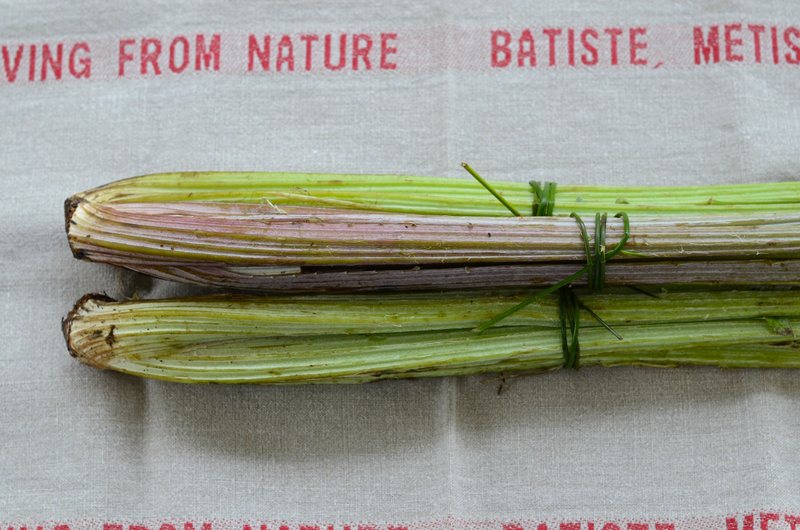 It is always described as looking like a relative of both celery and rhubarb when in fact, it is a first cousin to the artichoke. It is a thistle, with a flavor between an artichoke and celery. Cardoons are generally a little homely and off-putting in appearance, in my view, but this weekend, my corner green-grocer had long, elegant stalks, and I decided this was my moment to figure them out. Cardoons are stringier than either celery or rhubarb and therefore, must be peeled. The truth is, cardoons require quite a lot of preparation. I found that my wide 2″ vegetable peeler worked best, yet it clogged with fibers every couple of passes, requiring me to clean it out before beginning again. I recommend you put on a good audio book or podcast before beginning this task. Though they are a humble food, practically a weed, the amount of preparation they require motivated me to invest some serious cooking technique to elevate them as much as I could. I used Alice Waters’ recipe for Cardoon Gratin with Bechamel . She offers an excellent strategy for lightening the traditional bechamel sauce: “…save the poaching liquid from the vegetables, then use it in place of 1/2 of the required milk in the recipe,” (Waters, 2013). This method will simultaneously boost the vitamins and decrease the fat. Before beginning to peel the cardoons, prepare a large bowl of water into which you have reamed 1 large lemon. As you process approximately 4 large cardoons, cut them into 4″ lengths, then place them into the water to keep them from turning brown. Bring a large pot of salted water to a boil and cook the cardoons for approximately 12 minutes or until they are tender, but still have a little firmness. Lift the cardoons from the water and set aside to cool. Reserve the cooking liquid. Cut the cooled cardoons into 3/4″ diagonal slices and set aside. Now, make a light bechamel. In a small heavy-bottomed pot, over medium heat, melt 2 tablespoons butter. Stir in 3 tablespoons unbleached all-purpose flour. Cook the roux for a few minutes without browning. Slowly, whisk in 1/2 cup milk and 1/2 cup cardoon cooking liquid, prewarmed. To avoid lumps, whisk in each addition of liquid completely before adding the next. Bring slowly to a boil, stirring all the time. Turn down to a bare simmer and cook for 10 minutes, stirring occasionally to keep the sauce from sticking. Add additional cardoon cooking liquid if the sauce becomes too thick. Finish with a pinch of cayenne and some freshly grated nutmeg. Thoroughly mix the cardoons into the sauce. Butter a gratin dish and pour in cardoon mixture. Top with grated cheese. You could use parmesan, but if you have French cheese, this will take the gratin to the next level. I used a combination of Emmental, Beaumont, and Abondonce. Bake in a 375 degree oven until bubbling hot and cheese is lightly browned. Waters, Alice. 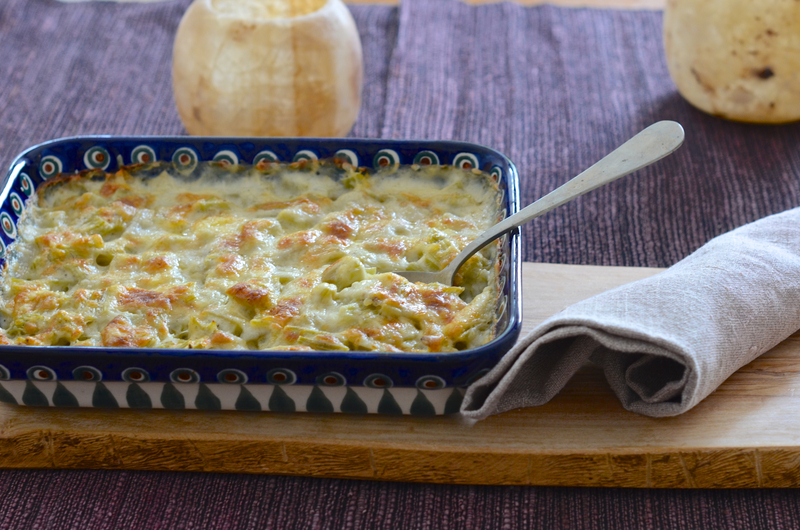 “Cardoon Gratin with Bechamel and Parmesan Cheese.” The Art of Simple Food II. New York: Clarkson Potter, 2013. 108. Print. I am reading through Paula Wolferts Mediterranean Clay Pot Cooking this week. I try not to let a cookbook like this discourage me. Sometimes I fancy myself as a Mediterranean culinary explorer, but now this book has made it painfully clear to me that Paula Wolfert already discovered it all and wrote about it all. The age of discovery has ended; this territory has been charted. Then, I wonder how many people actually read all 311 pages of her stupendous work and of those, are perhaps a good number so overwhelmed at the end that they never make a thing? This is exactly where I see my mission. I will choose to read through the great works and then actually pull out some gems to remember for myself and present to others who might not comb through them. Following with beak, neck, back, wings, feet, and tail. This is a terrible song! I had no idea, but darn is it catchy. 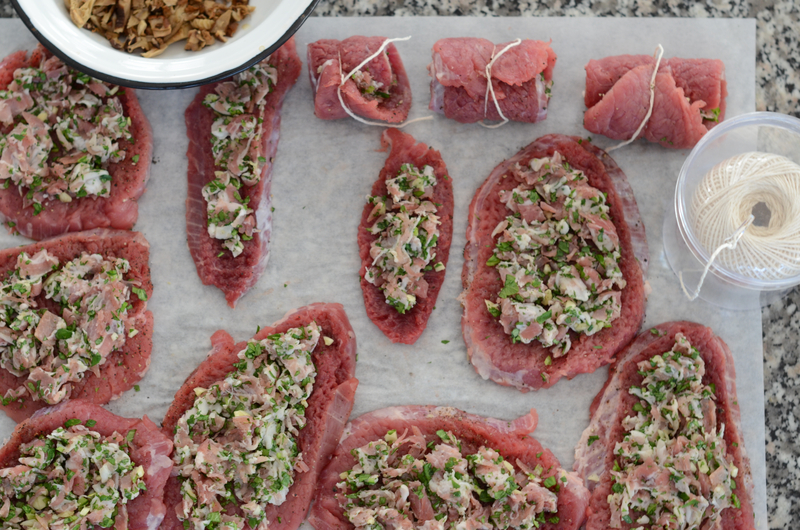 The connection comes from the shape of the beef rolls once they are stuffed and tied. I guess, if it was your point of reference, they might look like small decapitated song birds. This recipe has a few different bits to prepare; I won’t lie to you. It would work especially well if you had a kitchen friend to help prep up the various elements. However, once it goes to braise, you only need check on it a couple of times per hour. I am aware that I did not cook this is a clay pot. I think, like maybe a lot of people, that I’m not completely confident in my clay pot collection. Most of them are partially glazed, in some way, and I don’t know if they are up to this important task. I really can imagine how clay pot cooking could add a final delicious dimension to this dish, and I will work toward that goal. 1. Lay the slices of beef out on a work surface and pound gently to flatten slightly. Season with salt and pepper. 2. In a mixing bowl, combine the pancetta, mashed garlic, parsley, celery, nutmeg, 1 teaspoon salt, and 1/2 teaspoon pepper. Mix with your hands to blend well. Divide the stuffing evenly among the beef spices. Roll each slice up over the filling at the wider end, fold in the sides, roll up, and secure with white kitchen string or toothpicks. 3. Place the dried mushrooms in a small bowl and cover with 1 cup hot water; let stand for 30 minutes to soften. Remove the mushrooms from the soaking liquid, squeezing the mushrooms to release the liquid into the bowl. Reserve the liquid. Chop the mushrooms. 4. Heat the olive oil in a cazuela or cast iron dutch oven, set over medium heat. Brown the beef rolls on all sides, then remove and set aside. Add the onion and carrot and cook until soft and golden, about 10 minutes. Add the white wine, herb bouquet, garlic halves, tomato paste, mushrooms, reserved mushroom soaking liquid, and stock. Raise the heat to medium and bring to a simmer. Return beef rolls to the pot. Reduce heat until it gently bubbles. Cook on the stove top for two to three hours, until the liquid has reduced by more than 1/2, turning the beef rolls, from time to time, until the beef is very tender. If you can, chill the dish at this point and degrease before serving, even the next day. 5. Before serving, stir in the vinegar and capers, simmering for a few minutes longer. Correct the seasoning with salt and pepper. Garnish with the chopped parsley and thyme, garlic, and orange zest. Serve at once with mashed potatoes or buttered noodles. *There is an art to pounding beef for paupiettes. Use a kitchen mallet and a combination swoop and tap, working from the center to the outer edge to achieve even thickness. Be sure not to pound too forcefully, or the beef slice will tear. One of the few frustrations I have about my life on the Mediterranean is that I can’t keep a decent rosemary plant thriving in my garden. In this region, where rosemary can be considered more shrubbery than herb, I have to coax my leggy plants along and then just rip them out and plant new ones at intervals. I know that they don’t like our shady garden, and I’ve come to terms that I’m not going to have the aromatic, woody plants I have on Lummi Island, where the soil is well-drained and the sun is abundant (when it shines). We had one of those winter weekends spent dreaming about the upcoming growing season. Our winter garden, here, all greens and kale, has been giving diminishing returns, so we replanted most of it with more greens, chard and bok choy, but now, some pole beans and onion sets. Being unseasonably warm in the Pacific Northwest, Gabe tilled his vegetable garden, enlarging it from last year. He picked out his seeds from Seed Saver’s Exchange, where they now offer a service of a digital layout for how you should plant your garden if you give them your dimensions and seed choices. We have an investment in this garden, too, as it will be coming on at about the time we get home next summer. We are looking forward to, at least, several weeks of produce, plucked straight out of the ground. At our farmers’ market this morning, in what I call the mirepoix row: all carrots, celery, onions, and parsley as far as you can see, a farmer had massive bundles of rosemary for about 50 cents each. I am reading through The French Laundry Cookbook, circa 1999, this weekend, so I went to Thomas Keller’s method for making rosemary oil. This batch of oil will be drizzled over roasting vegetables, cherry tomatoes with garlic and thinly sliced new potatoes, that we will have with some crisp skinned mullet filets. Bring a large pot of salted water to a boil, using 1/2 cup of kosher salt to 2 quarts of water. Prepare a large bowl of ice water and set it aside. When the water is at a strong boil, dip the rosemary into the water for 30 seconds, then add the parsley and continue to blanch for another 10 seconds. Remove the herbs and plunge them into the ice water. When cool, drain the herbs and squeeze as much water from them as possible. 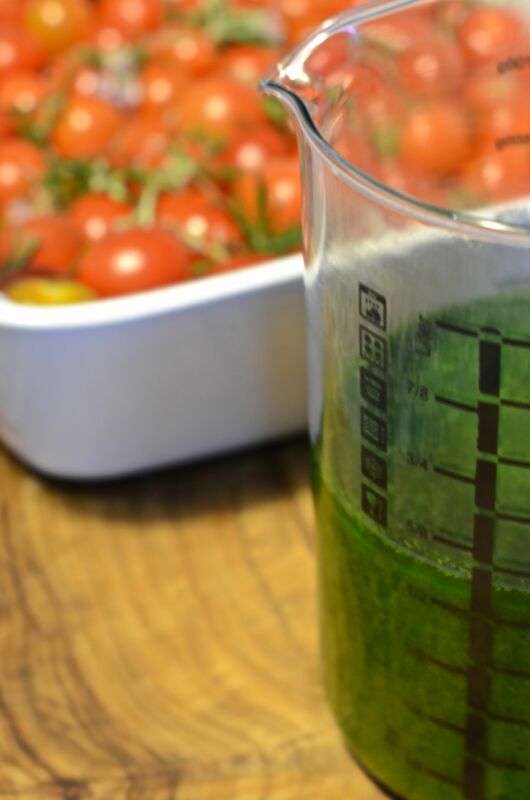 Place half of the herbs in a blender, covering with the oil. Blend on medium speed for about 1 minute. Turn the speed to high and continue to blend for another 2 minutes. If the oil begins to get hot, stop blending until it cools. Add 1/2 of the remaining herbs and puree for another 2 minutes, then add the rest of the herbs and puree for a final 2 minutes. You may further strain the oil through cheesecloth, for approximately 1 hour, without pressing the solids, but I didn’t as mine was well emulsified. Remove to a storage container and refrigerate, using within 1 week, or freeze in small portions. This is a good use for those tiny jam jars if you compulsively save them, like I do. Recipe adapted from: Keller, Thomas, Deborah Jones, and Susie Heller. The French Laundry Cookbook. 2nd ed. New York: Artisan, 1999. 165-66. Print. Part of the thrill of living in another country is never knowing what you might find at the local market. There is no way of predicting what people in the countryside are cultivating or catching, and often, when you see something interesting, it is a one-time opportunity. If you don’t grab it, it will be gone. 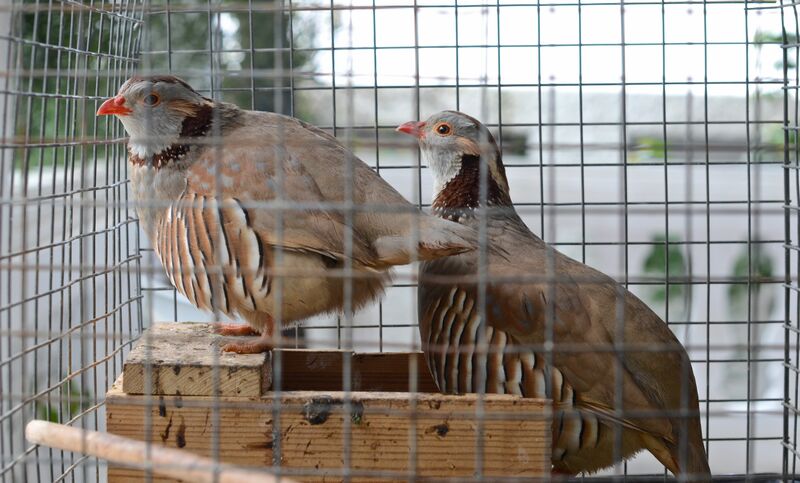 As Allan and I were leaving with our food purchases last Sunday, we spotted this breeding pair of Barbary partridges in a small homemade cage. We loved them instantly. They are beautiful, but also, there is something about their personalities, calm and a little shy. We’ve got them all set up on our terrace, now, right outside the kitchen, where we can watch them, while they watch the garden, and enjoy their gentle chucking. 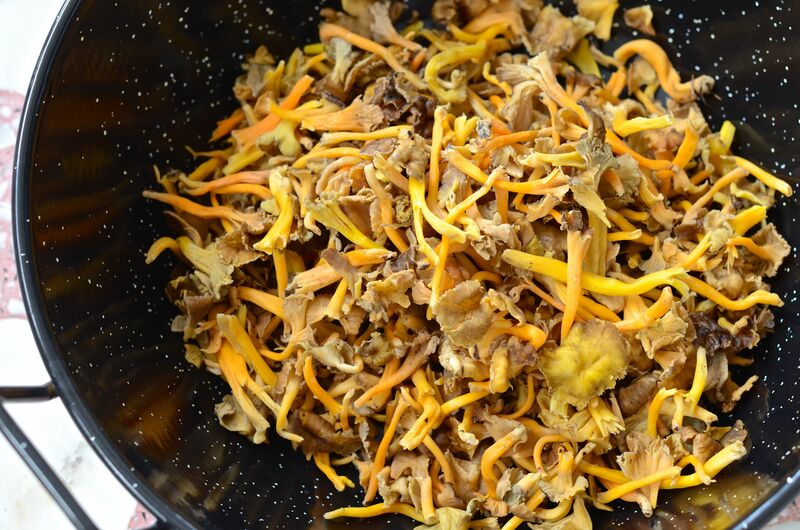 That same morning, we had grabbed about a kg of these hand-harvested mini chanterelles. I had been planning to make a risotto anyway, so these quickly became the focal point. I won’t go into the recipe for risotto; the process is fairly standard, and you can easily search it. I included the mushrooms, leeks, some homemade chicken stock, and a good amount of grated parmesan, so it was loaded with umami. Now, remember last spring when I was in Sicily and going on about the best arancini in the town of Taormina? 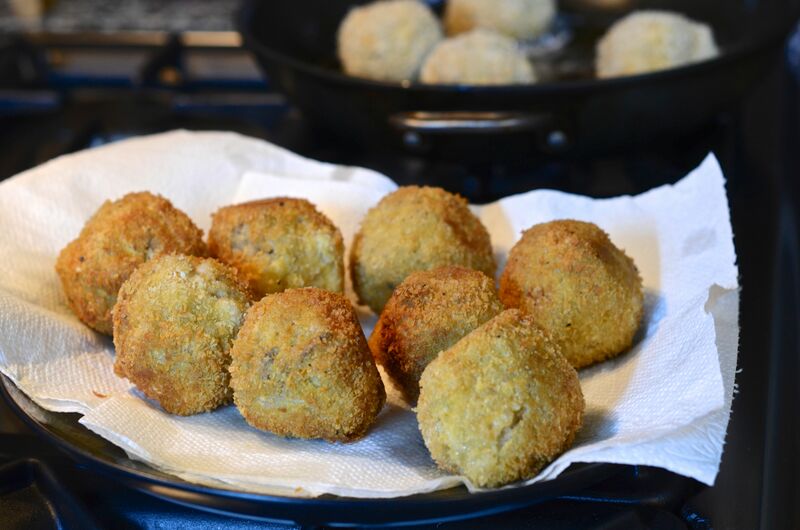 I then vowed to get into the arancini-making business, but hadn’t made a single one, yet. As my friend, Peggy, advised me at the time, you must use leftover risotto. 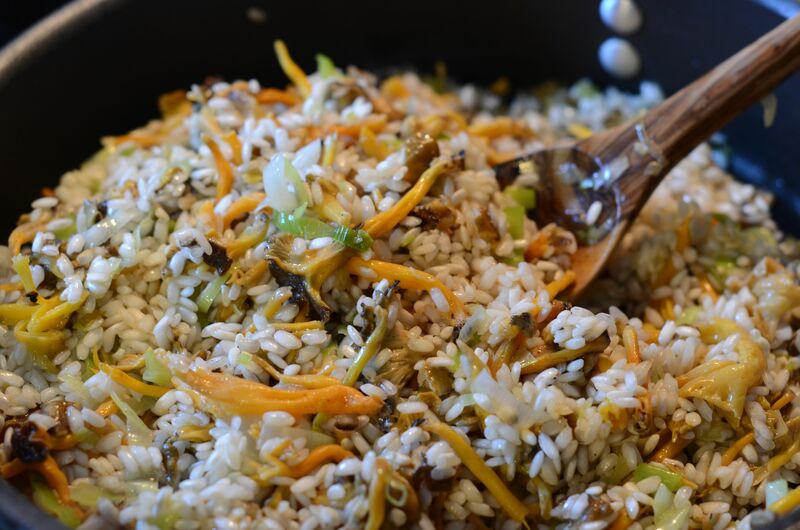 The gluten in the rice transforms, so they form up perfectly a day or two later. She was exactly right, and it was a quick process to scoop and press the balls, rolling them in a sequence of flour, beaten egg, and seasoned bread crumbs. We then pan-fried them, in olive oil, over very low heat until they were golden. These freeze well. Reheat them, right from the freezer, in a 350 degree oven.